Buscas la Mejor Yogurtera【2018】 ? 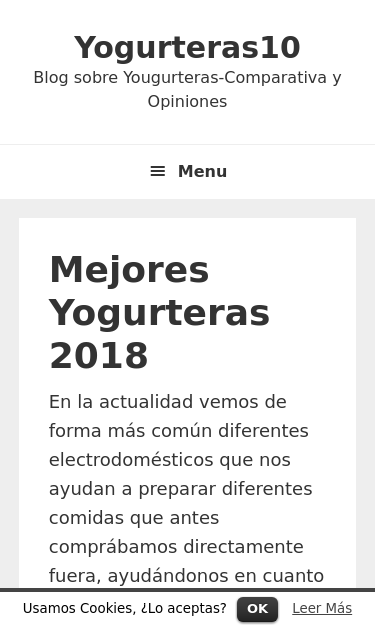 ✅ Descubre [AQUÍ] los mejores Yogurteras Tefal, Moulinex, Jata, Severin... gracias a nuestra comparativa, opiniones y análisis.☝ ¡Entra y descubre las mejores OFERTAS! We have found 9 URLs that are not SEO friendly! In order for URLs to be SEO friendly, they should be clearly named for what they are and contain no spaces, underscores or other characters. You should avoid the use of parameters when possible, as they are make URLs less inviting for users to click or share. - If your website is new and is not indexed by search engines you can replace underscores with hyphens or redirect those links to URLs that use hyphens.BUT, if your website is ranked well by search engines you do not need to do this (probably you have other ranking factors working very well). - The general advice remains: build links that contain hyphens rather than underscores and avoid dynamic URLs. Your webpage has 17 'img' tags and 11 of them are missing the required 'alt' attribute. Your webpage is using 35 inline CSS styles! Congratulations! The size of your web page's HTML is 17.58 Kb and is under the average web page's HTML size of 33 Kb. Your HTML is compressed from 92.80 Kb to 17.58 Kb (81 % size savings). This helps ensure a faster loading web page and improved user experience. Your site loading time is around 3.64 seconds and this is under the average loading speed which is 5 seconds. https://www.yogurteras10.com and https://yogurteras10.com resolve to the same URL. Your page is using the canonical link tag. This tag specifies that the URL: https://www.yogurteras10.com is preferred to be used in search results. Please ensure that this specification is correct, as canonical tags are often hard-coded and may not always reflect the latest changes in a site's URL structure.